HRS Chapter 205A-3.5 provides that the Office of Planning must maintain a public advisory body to assist it in working toward the implementation of an integrated and comprehensive management system for marine and coastal zone resources, consistent with the objectives and policies of the Hawaii Coastal Zone Management Act. 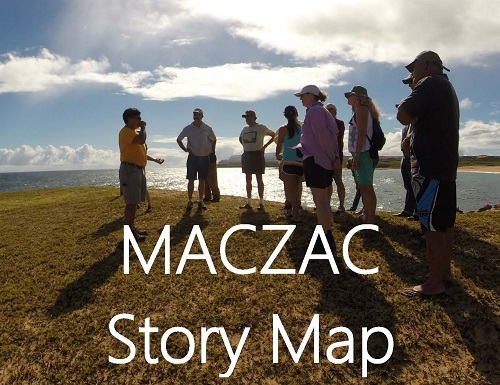 MACZAC is comprised of twelve advisory members recruited from the islands of Kauai, Oahu, Maui, Molokai, Lanai, and Hawaii. MACZAC members have diverse backgrounds in business, environment, native Hawaiian practices, terrestrial and marine commerce, recreation, research, and tourism. Since its founding in 2001, MACZAC has worked on the mapping of coastal parking access and recommendations regarding shoreline certification, commercial boating regulations, harbor facilities, integrated ocean resource management, cultural resources management, coastal water quality, coastal carrying capacity, marine managed areas, regulatory review, legislative advocacy, public education and outreach, as well as many other marine and coastal issues in Hawaii. Contact Lisa Webster at 808-587-2800 or by E-mail for more information or to receive electronic notification of MACZAC’s meetings.